"The Final Days of Superman" - Part 6: "The Great Pretender"
Superman, Batman and Wonder Woman continue their search for the Faux Superman. Superman weakens and has to continue the journey riding in the Batplane. Faux Superman continues his conversation with Lois and tells her that he has something to show her. In California the Superman from before Flashpoint and his son are cooking dinner when Lois and Faux Superman arrive at their door. Things are calm at first but Faux Superman goes off the chain and attacks the older Superman. Older Superman takes the fight outside leaving Lois and Jonathan behind. Superman, Batman and Wonder Woman arrive and after a brief encounter with the older Superman they confront Faux Superman. Faux Superman informs them that he is ready to accept membership in the Justice League. Story - 4: If this issue of ACTION COMICS taught me anything it is that you don't threaten the Pre-Flashpoint Superman's family. Because he will jack you up if you do. All kidding aside this was a great issue. Actually this is a great story but I really loved this issue. I have enjoyed the LOIS AND CLARK series that Dan Jurgens has been writing so seeing more of that Superman is fine by me. Is that biased? Am I happy to see "My Superman" back in the comics? Yes. Absolutely and I make no apologies for that. The reason for that, beyond coming from a different generation as a reader, is that DC is playing to both sides of the equation. Older readers, like me, get to see a version of the Superman and Lois we grew up with in the comics and we get to see their story continue. The idea of Lois and Clark having a kid is something I always wanted to see, so it's awesome to finally get to see that play out. The other side of the coin is that DC isn't simply setting the clock back and dropping us back into the Pre-Flashpoint/Post-Crisis world. 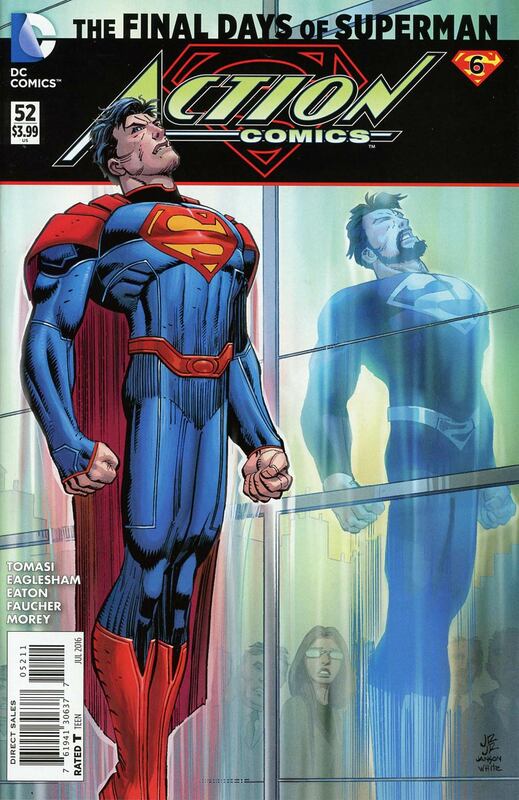 The older Superman is going to have to learn to live in a new world and that's intriguing. It's not ideal but it's better than what we've been getting lately. This issue had a lot of great moments. The interaction between Superman, Batman and Wonder Woman at the beginning of the issue is something I wish we had seen more of over the course of the New 52. Tomasi is hammering home the love that Superman and Wonder Woman have for each other and that ramps up the tragedy in an already tragic story. I also liked seeing how calm the older Superman was when the Faux Superman and New Lois showed up at his house. He was relaxed up until the moment Faux Superman put his son in danger and then it was on. I loved that. Absolutely loved it. The issue ended on a solid note and once again I am left wanting more. The only disappointment I felt was the length of the scene between New and Old Superman. To be honest seeing those two interact and talk was the reason I was looking forward to this issue so much. They were finally going to meet but that meeting was only a couple of panels. The rest of the issue was good enough that I was able to deal with that and not let it rain on my parade but still...I wanted more. Other than that this was a fine send off to this iteration of ACTION COMICS. Fifty-two regular issues, a zero issue and those twenty-three point whatever issues and here we are at the end. It's not the end but it is the end of an era and that's weird. At least it's ending on a bright note. Art - 5: The art was fantastic throughout the issue. I especially liked the detailing on the Faux Superman. His costume wasn't blurred or indistinct. It was just like the New 52 costume only on fire, which was a nice coloring trick. The action was intense and I loved how calm the older Clark looked when Lois and Faux Superman show up at his place. His body language was so relaxed up until the moment where things got real and then, as I wrote earlier, it was on. Eaglesham and Eaton made for a good pair on this issue and once again even though there were numerous artists the book had a consistent look. Cover Art - 5: I really like this cover. The trade dress is great and the image itself is classic. 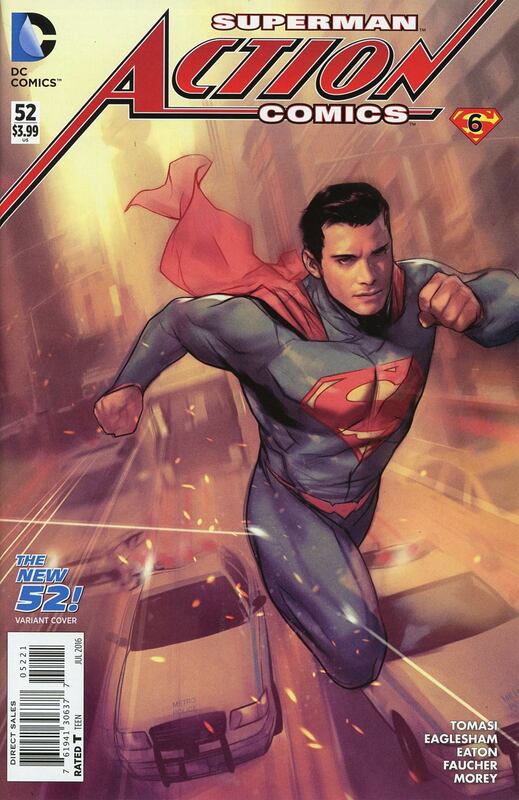 I'm still not the biggest fan of Romita, Jr.'s take on Superman but this image works for me. Variant Cover Art - 3: On one hand it is fitting that the variant cover to the final issue of this era of ACTION COMICS be an homage to the first cover. On the other hand I don't really like this cover. I would have preferred to see that T-shirt costume but then again maybe they were going for the "saying good-bye" approach and the newer version of the costume was needed. Either way I'm glad this is a variant and not the main cover.